Most often, the people I come in contact with that are looking to purchase a lake home in Douglas County want to be on a lake larger than 600 acres. This afternoon I decided to take a look at the breakdown of lake homes sales in 2013 to see the totals and the price ranges for lakes with sizes up to 600 acres and for those greater than 600 acres. Lake homes in associations or those that have deeded access aren’t included in the totals. The number of sales of all lake home types in Douglas County so far this year is 147. 20 homes at lakes with less than 600 acres of room to roam sold with a high price of $460,000 (Lake Henry) and a low price of $135,000 (Lake Victoria and Lake Burgen). 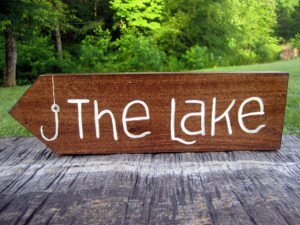 Lakes that have 600 acres or more had 72 lake homes sales with the sale prices ranging from $850,000 (Lake Darling) to $122,000 (Red Rock Lake). The $850,000 sale price is the high sale so far in 2013 for lake homes and homes without lakeshore. Of the 72 lakefront home sales, 6 of them were in the 600-700 acre size. Note: If you like ‘The Lake’ sign in the photo, it is for sale on Etsy.com.